The experts agree: The Bottom Ten race is still too close to call. While it's true that co-leader Ole Southern Miss is 0-9, and you can't get much worse than that, the school does have three (gulp) winnable games left---against the Funny Little SMUs (4-5), Texas at El Hail Mary Paso (2-7) and Memphis (1-8). Miss did, however, manage to take care of one obstacle, losing 19-27 to UAB (meaning of initials not certain), which was a 1-7 flowerhouse. Meanwhile, co-leader Ole Mass (0-9), showed what it isn't made of, dropping a 0-63 nail-biter to Northern Ill. But Mass also has must-lose games left against three pushovers---Akron (1-9), Buffalo (2-7) and Central Michigan (3-6). In any event, you can say this about Mass and S. Miss---right now, they're the L.A. Lakers of NCAA football. Electoral College's results were incomplete. 11. Washington St (2-7); 12. Auburning (2-7); 13. Boston College (2-7); 14. Virginia (3-6); 15. UNLV (2-8); 16. Cal (3-7); 17. So. Florida (3-6); 18. In line to vote in Florida; 19. 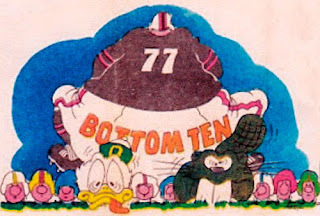 Buffalo (2-7); 20. Electoral College (?). *One of Colorado State's victories was over Colorado. Crummy Game of the Weak: Ole Mass (0-9) vs. Akron (1-9). Rout of the Weak: Arizona (5-4) over Colorado (1-8). S.I. Jinx at Work? 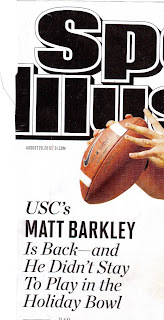 The Aug. 20 issue of Sports Illustrated devoted its cover to USC QB Matt Barkley and his decision to return for his senior year. At the time, USC was ranked in the top five in the nation. But after three deflating losses, with more conceivable defeats to UCLA and/or Notre Dame coming up, the Trojans may wind up right in the dud bowl game that S.I. had joked about (see below). Parity? Schmerity. Not in the NFL. There are tons of losers, fortunately for the Bottom Ten. Jacksonville (1-7), Kansas City (1-7) and Arizona (4-5) are riding the crest of 5-game losing streaks. Philadelphia (3-5) has dropped its last 4 and Washington (3-6) its last 3. Buffalo (3-5) and Dallas (3-5) have come up short in four of their last 5 games. Arizona was doing fine until cruel Sports Illustrated inflicted the S.I. Jinx after the fourth week of the season. "Four straight victories---and a sudden calm---suggest that Arizona quarterback Kevin Kolb has finally found his form," the magazine wrote. Whoops! Lost that form. Where is that form? Trying to stem the losing, the NFL gave byes this week to Arizona, Cleveland (2-7) and Washington. Speaking of idle, unemployed wide receiver Plaxico Burress was stopped for driving 125 m.p.h. but the ticket was thrown out because the officer cited the wrong law in the paperwork. "This is a great deal for Plax," mused Yahoo's Jay Busbee, "but a problem for the rest of us trying to beat---er, take a closer look at---our speeding tickets." The authorities are "going to pay a lot more attention to the bureaucratic details now." 6. Washington (3-6); 7. Buffalo (3-5); 8. Dallas (3-5); 9. Philadelphia (3-5), 10. N.J. Jets (3-5). *Which is what sports fans are saying to the NHL: Bye, bye. Crummy Game of the Weak: Dallas (3-5) vs. Philadelphia (3-5. Dishonorable Mentions: The Sporting News asked NFL players who the most overrated coaches were. Top three vote-getters: Rex ("Sanchez is my starting quarterback") Ryan of the Jets, Bill Belichick (New England) and Andy Reid (Philadelphia). He had it first: Last weekend, Neil King tweeted, ``Whenever the Redskins lose on the last Sunday before a presidential election, one of the two parties' nominees, loses, too. Always." Uncanny.